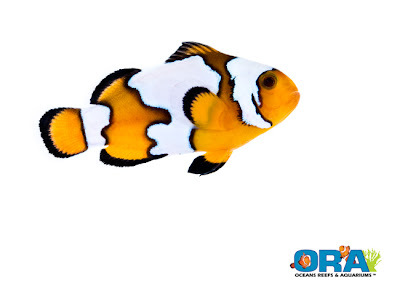 "ORA is introducing another new clownfish variety this month. The Black Ice Semi-Snowflake (Amphiprion ocellaris) was created by crossing a Black Ocellaris with a Snowflake. We were really hoping to get a Black Snowflake but wound up with an orange one with ultra intense black markings. These guys have yellow-orange bodies with an irregular white zig zag in the mid-section. The thick black outlines really make the colors pop." Available for about 1/3 the price of a Snowflake clown in limited quantities, these are sure to go fast. I have several extremely aberrant ORA clowns in my store, and I have to say they might be more beautiful than their near albino brethren. The characteristic cheek spine or eye dots and jagged markings make them very unique. ORA's new coral release for the month is the Blue Cespitularia. This is a very welcome coral to the industry as soft corals gain popularity again within display tanks. I have been farming a garden variety Cespitularia, and it has been quite popular as this coral is rarely available, even in normal colors. This variety is absolutely stunning and one can imagine how nice it must look under reef lighting or LEDs. Tyrpically soft corals with such vivid coloration require a good amount of supplemental feeding, but you can be assured this ORA piece is well adapted to tank life. 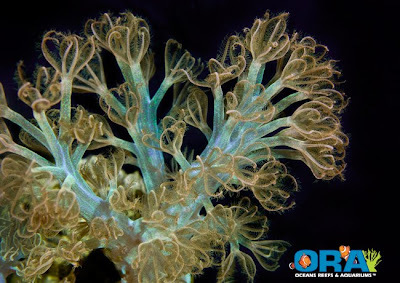 "ORA now offers a unique variety of Blue Cespitularia which has a sparkly turquoise body and peachy-orange polyps. This variety differs from the African variety which has a darker blue and purple coloration. It is rare to find such a bright and beautiful soft coral that is photosynthetic and so easy to care for. Blue Cespitularia, sometimes referred to as “Blue Xenia”, is one of the most sought after soft corals in the industry. The color and movement of this coral appeals to all types of reefers, and its peaceful nature and hardiness make it an easy addition to any reef tank. Blue Cespitularia adapts to a variety of lighting conditions, but we have noticed the most intense coloration under lower light levels when compared to typical SPS requirements. So as always, we suggest starting this coral out on the tank bottom and gradually moving it up to the desired location. Our other observations show that this coral prefers moderate to high water current and spreads by sending out a foot-like projection which attaches on to a nearby rock or solid surface." These, as well well as all of the other ORA favorites can be found at The Mystic Reef.